Imagine buying a designer’s pair of shoes and also having £500 worth of Uber credit that comes with it. Just the case the Charlotte Olympia Sandal and Uber collaboration. Only 14 pairs were made and exclusively sold at Harvey Nichols. It also gave me the opportunity to see all the latest collections. In particularly Charlotte Olympia new collection. I am a big fan of her shoes. They are fun, funky, full full of character and sass. 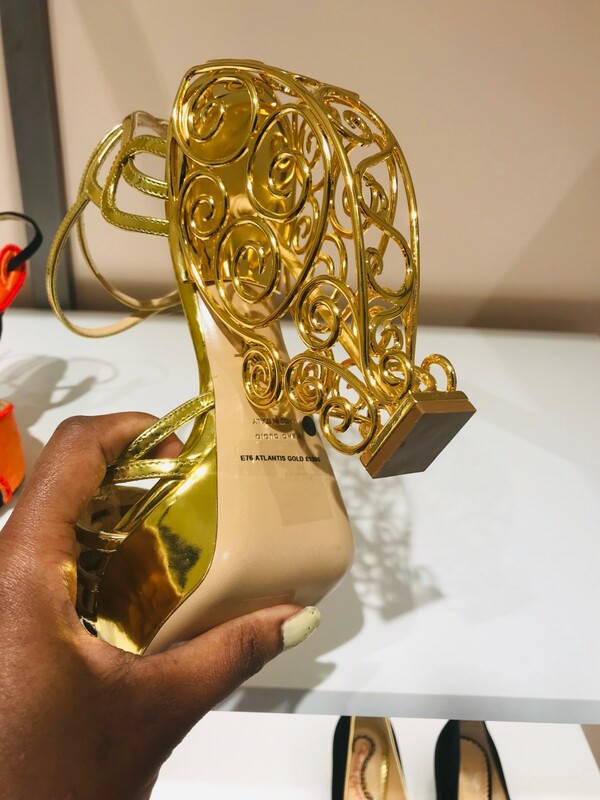 But her perrfect10 brass caged heel, designed exclusively for the 10 years anniversary of the brand. As described, Every lady’s wardrobe should include a fantasy shoe like Atlantis. First released in the Spring ’12 collection, ‘Sirens’, this exquisite gold metallic leather and gold galvanized sandal is inspired by the sublime architecture of the mythical lost city. What do you dear readers think of that design? And as much an I loved it, it is currently sold out everywhere. Thinking of all collaborations that have been done, then you see a cab company doing one with a women shoe designer. I mean, How genius is this collaboration? The limited run of 14 pairs was available exclusively at Harvey Nichols’s flagship Knightsbridge and is also sold out. And of course, it will be. With £500 of Uber credit, I will even call an Uber just to get to my local corner shop. Duh! And for the visit, here is what I wore: An all blue look. You might as well call me baby blue.